The primary purpose of an intercooler is to decrease the intake air temperature to prevent knocking and increasing the horsepower. An intercooler also makes a bold statement about a vehicle's characteristic because it most often sits in a very visible location of the vehicle. The highly praised R-SPL and V-SPL intercoolers from Trust celebrates its 10th year anniversary this date with a revamped unit. The SPEC-R and SPEC-V models are released to the market with considerable improvement over the R-SPL and V-SPL in terms of cooling efficiency and minimal pressure drop. The SPEC-R is recommended for high powered applications when the SPEC-V is targeted towards vehicles with stock characteristics such as simple bolt-ons and increased boost levels. There are other changes to the new intercoolers as well. The center core also sports a polished look along with the end tanks. For the first time ever, a polishing process called CCP (Chemical Composite Polishing) had been used on these intercoolers. This process removes the minuscule surface bumps and holes on the core and end tanks, producing a radiant shine; especially against any form of light. The CCP process also prevents and stops rusting properties on the metal. These intercoolers are scheduled to be released in June 2006. With shiny great looks, and long lasting efficiency, this item is the part to get for the summer! Trust's flagship model, the SPEC-R series intercoolers are recommended for high powered, high boost vehicles. The core and the end tanks are polished to the tips of the inlets. The HG series have polished pipes included. The photo on the left is the R-SPL unit, and the right is the SPEC-R. The SPEC-R version had its core treated with the CCP process, and the difference is enormous in terms of the shine. 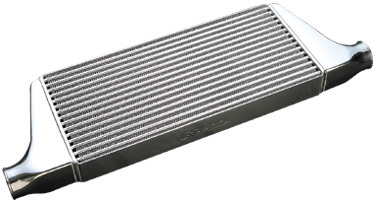 This intercooler was designed for low pressure drop and lightly tuned vehicles. Although the end tanks and the pipings aren't as shiny as the other unit, but polishing them yourself is definitely an option. Once the hood is propped open, the polished core is highly visible to anyone. The Greddy logo is placed tastefully on the unit. A new intercooler with the best cost per performance! Along with the release of the SPEC-R and SPEC-V, SPEC-M is scheduled to be released concurrently. The biggest difference between this unit and the others is the price. This unit is not a tube type, but a laminated layer type inside the core. The CCP process had been omitted to keep the cost down, however, the end tanks and the pipings had been buffed for that shiny intercooler look.